I was following up on a newsflash about the dangers of inefficient indoor cooking stoves. The pollution is substantial and harmful - and an eventual killer, comparable to malaria in numbers. Cooking is of interest to us as we promote our Hot Box as an energy saving device, requiring a heat source for much less time in the cooking process. If the heat source is fire, then less firewood is required and cooking can continue safely unattended once the pot has been brought to the boil. If the heat source is gas or paraffin the same applies – less of the fuel is required, cost saving takes place and safety is promoted. So in following up on the news article I came across another one by serendipitous accident. The writer is an Indian living in the UK and as I grew up on the English-speaking South Coast of KwaZuluNatal, South Africa, among the descendants of Indian indentured labour I have a natural affinity for all things Indian, from food to extended family and the accompanying noise levels. As a kid my friends next door were Indian and we were blessed with countless invitations to weddings and festivities through the years. Once we attended a fire walking ritual and to this day I can still feel the heat of that fire from a couple of metres away whilst a guru and others walked through it, some of the fellow walkers dancing behind him playing whistle like instruments. Not a blister on their feet ... but then India has a long and rich cultural heritage stretching back for thousands of years! Being of Italian origin helped ... I once said to an Indian friend after watching a magnificent film called "Monsoon Wedding", the 'Italians are the Indians of the West' and the 'Indians are the Italians of the East'. The complimentary article I had spotted was well written, with a nice flow to it, and complimented the one that lead me to it. It was the website credo though that also caught my attention, that “Serendipity means fortunate discoveries by accident”. What was symbolic about this website is the graphic of the little butterfly flapping its wings alongside the message of Serendipity. One cannot be too discarding of little butterflies flapping their wings, as seemingly insignificant as they may seem, the flapping can trigger of unpredictable chain reactions. At least Eastern cultures have tended to see it this way as an obvious Truth. And Civilization has been part of their Geography for millennia. (Why this weird stuff as a Managing Director of a company we were having discussions with once opined when we were waxing lyrical with one of their consultants about data ‘blossoming’ into "flowers" of geo-information contained in a 3D xy&time jigsaw puzzle that we call a GeoBox. Actually, metaphors are powerful tools to help envisage abstract concepts like data linkages in an enterprise with time based geo-locational contexts and events. The same geographic space may contain varying objects over time overlapping each other if we do not use time as a distinguishing factor ... a 3D jigsaw puzzle is a useful way to address this reality; metaphors and other weird stuff QED). But Chaos Theory, a formal if not easily understood branch of mathematics, does the "weird stuff" by proposing the absurdity inherent in the butterfly metaphor. In fact, Chaos Theory is about the Butterfly Effect! 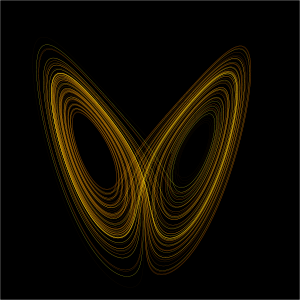 And the image at the top of this article, a plot of the Lorenz attractor for values r = 28, σ = 10,b = 8/3, looks just like a butterfly! So it is safe to say that we are still in the realm of science even if we marvel at the possibilities of metaphorical flapping butterfly wings. The Obvious World of the 20th Century is behind us, never to return. It is better that way - too many deaths in the first half, and too much destruction in the second. We need its Linearity but we now need to deploy that into the Lateral Thinking Age that we must move into for the future of the Planet. "Logic seems to rule the world. Scientists look for patterns and researchers seek out systems, but the world has shifted; shifted to the side of creativity." There are a number of ideas that somehow seem to naturally belong together if we are to go Lateral. One is the idea of “action through non-action”, or Wu Wei as it is called out there in the Far East. It is a quiet but attentive state of mind, watchful, alert, energy efficient, ready to spring into action at the right moment for the right reason. Coupled to this is Zen. Zen is a mind-boggling idea of strange paradoxical puzzle poems but one of its characteristics is that it seeks to root itself in reality, a practical culture – and when it acts it, acts explosively. Or at least that is the way that I understand it. And if so it is the perfect companion to Wu Wei. Coming back to Serendipity, there is something in this word. It almost leads you into the idea of ‘serenity’. I think though, that to experience Serendipity, you need to be open to it, your mind open to the 'weird stuff' so disliked by the consultant's boss. Fibres have been developed that are 1/10 000th of a human hair, yet strong enough to move and rotate objects 2000 times their size. This is a first generation development and already these artificial micro muscles have a power a thousand times greater than existing artificial muscles composed of shape memory alloys. Somewhere in this the Hand of Serendipity must have played a part - a fortunate discovery by accident. Possibly most of the great discoveries arise through Serendipity. Newton had that moment when yet another apple almost fell on his head! Einstein, when he was day dreaming on a train watching bell towers with clocks ... and now we know Light bends with Gravity. We face the Challenge of Greening the Planet for our survival. It is a multi-dimensional, multi-faceted challenge. We will need all the fortunate discoveries by accident that we can muster! For example, in South Africa we also face growing unemployment among the many other sustainability issues we face. There is an emerging consciousness with regard to the role that the Green Economy could perform in addressing job creation. But we are still very caught up in the idea of the Formal Sector. Formal Sector job creation is very expensive, yielding relatively few jobs for the spend. It is a ‘too much’ action thing, not very Wu Wei. It is also a slow process. It is almost distracting, taking us away from a more watchful, alert, ready to spring into action mode. There is something inertial in the Formal Sector mentality, destructive of a fast Zen-like spring into action. Too many regulations, corporates positioning themselves, hidden agendas in the minds of corrupt government officials. Too many "tenderpreneurs" as we call them, ready at the flap of a tender document to build sand bridges that will be swept away into the crocodile infested rivers of Limpopo and Mpumalanga (... in South Africa we build Sand Bridges not Sand Castles). The Formal Sector mentality is also tightly bound to vested interests, and in that it does not generally welcome ‘fortunate discoveries by accident’ that might pull the rug from under their feet. Such Serendipity can indeed upset the Vested Interest Apple Cart. Unless, of course, they can be subsequently controlled by the Vested Interest. Whilst all this positioning takes place, little butterflies continue flapping their wings in a myriad of instances, until just one more butterfly wing flap causes Chaos ... it could be that one last breath of pollution from an inefficient stove. There is an energy about Serendipity, especially in the browsing of the Internet. Keeping an open mind whilst browsing will lead to "fortunate discoveries by accident" with a high degree of probability and unimaginable possibilities.